With an emphasis on respect, safety, and plain ole good manners, the rules of cowboy etiquette have been handed down through the generations, and part of Trapper’s Rendezvous code of conduct. Old-time cowboys weren’t all hard-living, tough-as-rawhide loners. A strict code of ethics and etiquette underscored the Way of the West. Remember: Ladies first, take off your hat when you're inside, and mind that you say "ma'am" and "sir." Hats Off: Hats are removed to eat, enter a home or private office, and to address the flag during the National Anthem. When being introduced to a lady, remove or tip your hat—but never to a man. (That’s an insult.) Keep your hat on at the bar, in public buildings, and at the theater, unless it’s blocking someone’s view. 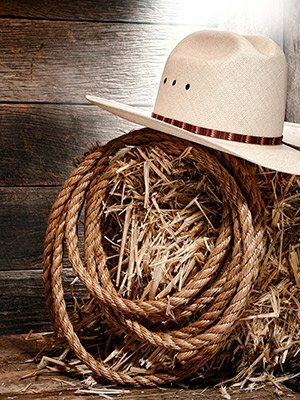 Many rodeo cowboys believe it’s bad luck to lay their hat on a bed. Gate Keeper: Always leave a gate how you found it. If you’re in a truck or a wagon, the man farthest to the right is the one who hops out to open and close gates. Honor Code: Never criticize a man’s horse, dog, cattle (or wife, for that matter). Don’t pester a stranger for personal details or ask a rancher the size of his herd. A handshake seals any deal. Do Drop In: Cowboys out gathering cattle or riding fence could rightly expect to stop at a nearby ranch house for a meal or even a berth for the night. In fact, dude ranches were born of this tradition. Getting Even: Practical jokes are an acceptable form of retribution. One old-timer we know tells of being forced to take the boss’ city-slicker nephew on a cattle drive. Weary of the guy’s incessant whining, our friend and a co-worker rubbed chile pequenos on his drawers while he slept. The next day, the nephew squirmed in his saddle under the hot sun and jumped off his horse to frantically strip naked. He assumed a nasty critter was biting him. Ride for the Brand: The Cowboy Way is a work ethic - and a life philosophy - that includes a willingness to give 100 percent in any situation. Humbleness and practicality are also central to the creed: When herding cattle, don’t sort the animals without being asked, and ride drag (back of the herd, not wing or lead) unless instructed otherwise. Loyalty to one’s employer and personal integrity are sources of pride. Avoid cutting off other riders, and never ride out in front of the boss! And remember, a real cowboy never complains—no matter how tired, cold, hungry, thirsty, or hurt he may be.